Traditional handworks with embroidered messages have gained new attire and became an opportunity for social criticism. The authors, united in a group called “Impractical women”, use “kuvarice” to state their dreams of progress. Remember “kuvarice”? These were once the most beautiful decorations that could be found in the kitchen and other houserooms, with embroidered images and texts. The texts were instructive – at least according to leading principles of that time – and they addressed all kind of situations, from religious convictions to family relations. They’ve been brought to Serbia at the beginning of the century from Netherlands through Germany, Austria and Hungary, at first coming to life by the hands of women from Vojvodina. 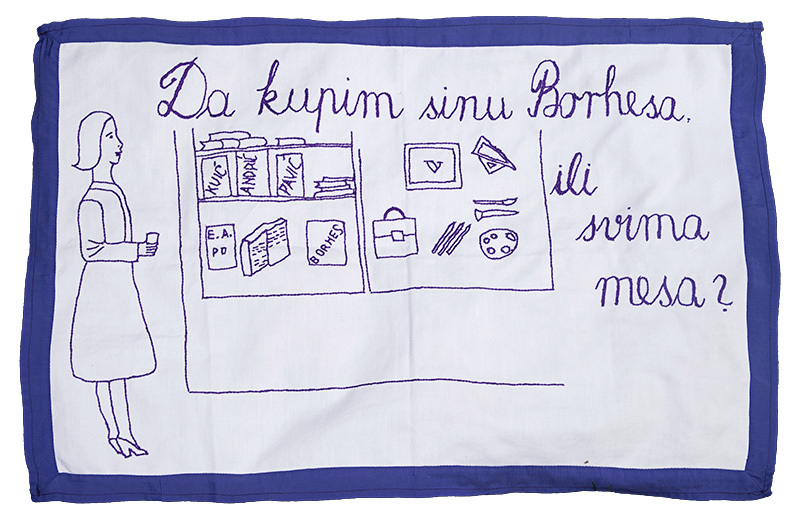 The best-known rhyme “Kuvarice manje zbori da ti ručak ne zagori” wasn’t the only one, so our ancestry learned about proper table manners, but also how “good hygiene is half the health” through these illustrated pieces of canvas. They would usually cover and protect the wall above the stove, but they also hung above marital beds and even in bathrooms. The observers were usually struck by their wit, while the owners would be compelled to preferable behavior. More precisely, these who were compelled were the female owners, because these sentences mostly referred to housewives. They would, for example, remind them that “love comes in through the stomach” with an inscription that stated: “koja žena muža čuva, njemu dobar ručak kuva” (a woman takes care of her husband by making a tasty lunch for him) or to restrain from talking since “za razgovor vremena nema, treba brzo ručak da se sprema” (there is no time for conversation, the lunch needs to be made). These inscriptions didn’t leave out the husbands either. They would reprimand them with the following approach: “Zašto gledaš ti u lonac, kada nisi dao novac” (why are you looking at the pot when you haven’t given any money). And finally, the two would be reconciled with this offer: “Ružice, srećo moja, daj da ti ljubim medna usta tvoja” (Ružica, my dear, let me kiss your honey lips). The universal language of drawings depicted accompanying scenes with all fashionable details of the time, with borders embellished with flowers and a white background with a role to emphasize the point. This time has passed, “kuvarice” have been replaced by more efficient ways of interior protection and they became appreciated artifacts from antique shops. New views, including feminism, had a lot to say about these traditional wall inscriptions. Is the woman’s workplace some place she’d have her head submerged in an oven, is her only function to take care of her home, is being obedient to her husband the key to a successful marriage? The advocates of equality, both male and female, have been asking these questions. No, it isn’t, and it’s what the ladies of a former time had fought for. However, there are many other topics that could have been subject of discussion through these canvases. 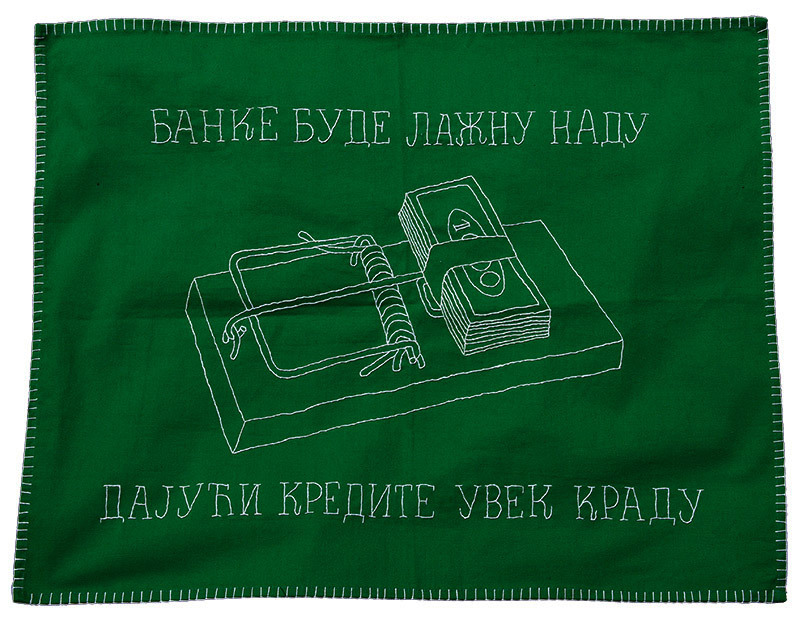 This broad field of comments on the subjects of politics, economy and other branches dictating everyday activities was first approached by the art group “Škart” from Belgrade. The group poses questions about today’s “ordinary” women and how they can contribute to philosophy, psychology, sociology and other fields of science. At first it consisted of female gastarbeiter2 girls (foreign workers), or wives of temporary workers at foreign countries. This proven model was then transferred to single mothers and refugees, and later it was released of all gender and status related connections. Even men and students do the needlework now, basically anyone who can find the time and knows the craft. The talent was given to all of us, so it’s only the matter of finding a little spare time every day. For Lenka Zelenović, this free time is at night. It’s when her apartment gets quiet, and everyone living there falls asleep, although the only permanent resident of the household is her daughter Jelena. However, sometimes Lenka’s sister drops by, the same one that sews lace around “kuvarice”. This is because “dozidnici” or “nazidnjaci”, how embroidered illustrated inscriptions were professionally called, were a product of a collective state of mind and the work they need implies communion, even thought it’s not necessary. But, it is easier and more fun to do this way. However, because creativity requires solitude as well, Lenka works at night. She copies a drawing on a piece of thin white canvas, and starts to sew in key words with a red thread, while she uses the blue one for the rest. She gets inspired by current events – something a political party leader might have said or did on TV, and that kind of “kuvarica” Lenka classifies as “political”, among which some nostalgic ones about Tito could be found as well. Sometimes she observes long lasting occurrences that are focused on life habits, and she dubbed them “environmental” or “ecological” (“Ne bacaj đubre s terase, vidi se, prljava si, zna se” – do not throw the rubbish from the balcony, we can see that you are dirty). The more personal ones refer to family relations, Lenka’s worries and dreams. Although she’s almost seventy and didn’t have an easy life, and despite the fact that she just had hip surgery, she’s lively and vital. A little bit rounded, but not chubby, she can simultaneously make fruit syrup mixed with sparkling water, or “fanta shokata”, as she likes to call it, and homemade vanilica3 cookies. All of her culinary imagination retreats in the face of the challenge called “McDonald’s”, at least when her daughter Jelena’s taste in food is in question. Motherly concern turns into mild reprimands, filled with humor. Wit is usually what salvages every situation, and it works like a charm with this one as well. Therefore, wit is a trademark of Lenka’s handiwork. From her first one “Deset sa lukom, deset sa mukom” which puts ćevapčići4 into focus (ten ćevapčići with garlic, ten with worrow) but points to something entirely different, all kinds of captions emerged. “I have a special notebook for writing down ideas so I wouldn’t repeat myself”, Lenka laughs. Jokes are a remedy for all hardship and an equally important way of expressing rebellion, while it seems as is if though Lenka was born for this. “I was always the black sheep of the family, always headstrong”, she laughs again. A lot of time has passed since the days when she made most of the steps in her life, some of which were wrong, to spite her father. With all of her acquired knowledge, including the one that there are no wrong steps in life, she was lead from inside toward a predetermined goal. After all, if things were different, Lenka wouldn’t have become one of our most famous homemakers. Crowned with fame from exhibitions all over the world. Mostly recognized for political comments such as: “Misli da i dalje može da krade jer mu to njegovo direktorsko mesto dade” (he thinks he can still steal, since his position makes it possible), “Vile, kuće, kola razna krase tajkune dok se ne sazna” (mansions, houses and cars belong to the rich men until we find out) with the extension “A kad se sazna, ne sledi kazna” (and when we find out, they don’t get punished); “Točkići na ministarskim foteljama služe da lakše od fotelje do fotelje kruže” (the wheels on the chairs of Ministers serve for them to go in circles) and such. They have been globally liked for those dedicated to Novak Đoković. It’s impossible to list all of her works seeing as though there are almost four hundred of them. They stay in Lenka’s hard working hands only for a little while, hurrying toward the rest of the world to be celebrated. In this way, they fulfill their role of “vents”, which is how Lenka perceives “kuvarice”, that is, as stress stabilizers. Whatever it’s cause may be – sadness, anger or euphoria. On the other side of the Danube, bearing in mind that Lenka is a Newbelgradian, in the prairie-like city of Zrenjanin, live Pava and Brigita, respectively a resident of the Geriatric center and a therapist in the same institution; both are included in the making of new “kuvarice”. They are united under the new name of the group – “Impractical women”, which is an allusion to a former magazine called “Practical woman”, today a TV show that hands out advice to women: how to bleach your stains, but also your teeth, and how to remain young forever. This topic inspired Brigita Međo, and she speaks of it with the caption: “The cosmetic industry makes false youth, I’m fighting for the right to remain old”. But we’ll talk more about Brigita later, which would, I assume, also be her wish, judging by her specific character. Pavka Martinović has lived in a Home for four years, a Home which is pejoratively called an “old people’s home”. And completely out of place, judging by Pavka’s youthful energy. Also, judging by her readiness to learn and find out something new every day, or at least relearn. Because of this, she is a beginner at a German language class. English would practically be a complete novelty to her, if you don’t count things she picked up in movies, but Pava was late for enrollment. The rejection was accompanied by a remark to the professor: “Just so you know, you’ve lost an excellent student”, thereby implying her tendency to be the best at everything she sets her mind to. This new environment was, for Pava, this lovely and gentle woman – despite her progressive principles – an opportunity to write poetry for the first time. She read her poems publicly at “Pesničenje”, a mobile platform for presentation of poets for which rhyming and modern poetic forms aren’t a profession (which is also a part of Škart). She was received well at multiple cities across Serbia. She wasn’t taken by this newly discovered fame; she perceives it with a certain amount of distance, almost scientifically, because, after all, she used to work as a professor of mechanics and mechanical technology. Viewing the world as a whole from a distance, Pava’s artistic approach shows that nothing is one-dimensional. 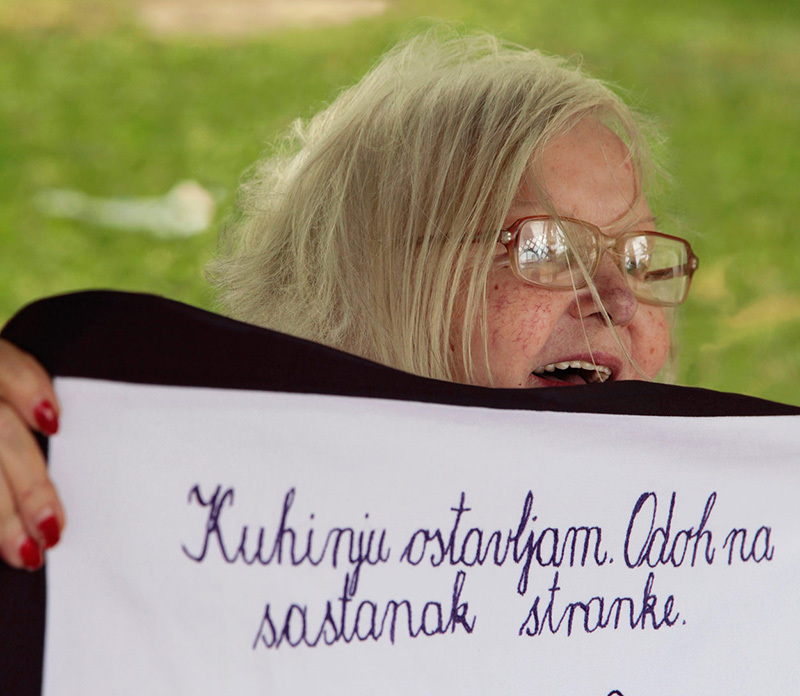 Hence the slogan: “Od šporeta kompjuter joj je draži, šta u njemu domaćica traži” (she prefers computer to the stove, in which she finds no use) that speaks of the dangers of modern technology. An illustrated scene of a messy house accompanies this intriguing rhyme, with children running around. The mother doesn’t care for that, she’s “chatting”. Maybe she’s in the right, doing it for personal improvement, and maybe she’s not. Pava always leaves her works “open to interpretation”. While emphasizing this, Pava laughs provocatively. She looks at me above her glasses, meaningfully, yet pleasantly. The verses she wrote came to her easily, she is aware of this, and she has never doubted her drawing skills. She’d put simple characters in motion by emphasizing details, in order to express the essence of the scene. “As you can see, this woman is superior, a candidate for a bank’s board of directors”, she points to a large female figure looking in the mirror. The husband, squeezed into a much tinier body, will be waiting at home, doing “women’s” work. Whether this is good or bad, Pava leaves us to conclude on our own. Aware of the language barrier, being surrounded by Hungarians, she tries to make the message as understandable as possible. 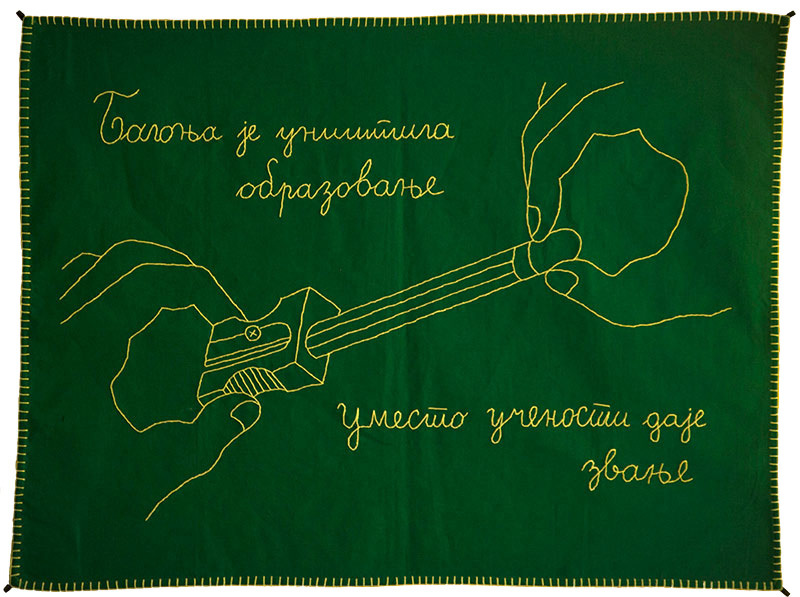 For the sake of her neighbors, Pava sews in Latin (Roman) script, or at least mixes it with Cyrillic script, while using all of the already mentioned, but also all other means of visual communication. The combined artistic form of “kuvarice” allows Pava even more creative freedom than poetry. “The complete lack of boundaries is a challenge for me”, she testifies. Documenting of the “here and now”, which is how she sees the purpose of “kuvarice”, is filled with various controversies, in a sophisticated, ladylike way, without hurting anyone all the while getting everyone to question things around them. Pava is yet to shine in her full power at the Museum Night, in Titel, with an independent setting of embroidery with a message and a solo poetic performance. She’s going through a pile of her former work, with her able but nourished hands, searching for the ones that will present her in the best possible light. Looking at things from the point of view of a buyer, I wonder how “kuvarice” are cleaned. “They won’t get dirty, you won’t keep them next to jam”, answers Pava jokingly, in this way putting the final dent in the notion of old-fashioned standards. Pava sometimes strikes the system itself by saying: “until recently they called me ‘referent’, so now I carry these banners” (“give us back our factories”). Brigita is the most important part of Pava’s favorite pastime, since she introduced her to the empire of new “wall stories”. Birgita is a true example of someone doing what they really love. To be of help for every resident of the Geriatric center, where she works as a senior therapist. This means finding an agreeable occupation for everyone, a proper workout for the mind and the body, from goldsmithing, through tapestry to collages and goblens.  She skillfully avoids being the focus of Milica magazine and wishes someone else gets to shine: one of the makers of numerous handiworks displayed in two rooms, but also all over the corridors of the Center in Zrenjanin. 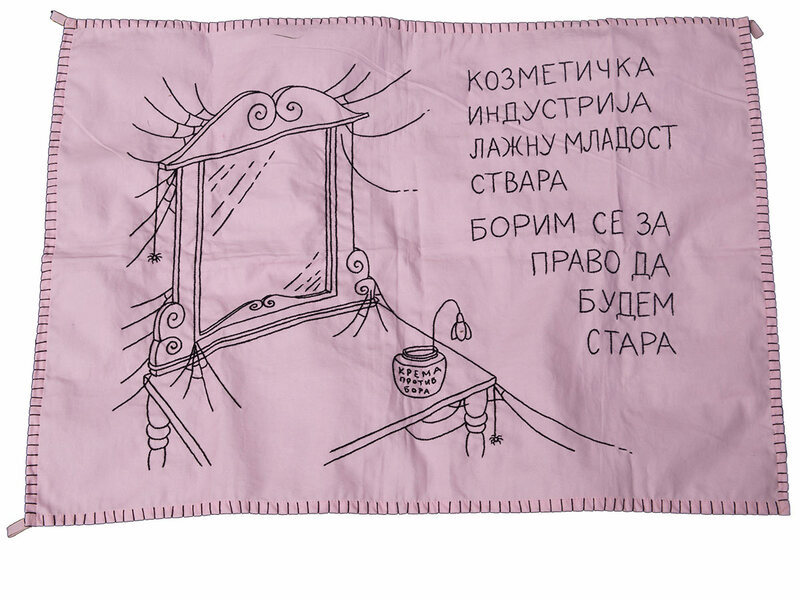 Brigita’s idea is to display “kuvarice” and other works in the rooms of the residents as well – to enrich their lives with obvious and immanent slogans and lessons. To make every morning “good” and every sleep “well” with inspired notions. Brigita’s “kuvarice” differ from others by various items. Firstly, the drawings are more skilled because they’re being done by a professional, usually by Vladan Nikolić, a world-renowned comic book author currently out of work. “The ultimate reach for me is a Stickman”, she laughs with her lips and eyes. She assumes I already know that the method of prosperity for all associations is networking, and by extension also of “Impractical women”. But it’s not anymore. That’s why I find it unusual that Brigita is not a complete author, as if I find it a little sad that other people sometimes knit her thoughts. However, it’s a tested recipe for cooperatives, and the achievement is that the “I” doesn’t come before anyone. After all, it’s the best way to save time, which is also the biggest motivation for the division of work. The base of Brigita’s or community drawings is rarely white, but rather red, blue, green… They are used to express thoughts of a variety of philosophical, social and similar phenomena. So, she says: “Sudbina brzo nit’ vremena mota, poklon je svaki trenutak života” (the destinity knits the time quickly, every moment of life si a present). Or, “dok duša radost snuje, razum uvek sumnjom truje” (while the soul dreams of happiness, the mind is in doubt). Also, “Svet u propast hita, ne interesuje ga ontologija bića, već profita” (the world is running towards disaster, not interested in the ontology but in profit) as an epitaph on a grave. Or/and, “Bolonja je uništila obrazovanje, mesto učenosti daje zvanje”. Sharp and witty, but also rhythmic, these verses are used to express warning and teach important lessons. Comic-like shapes are pretty basic and metaphorical. That is how Brigita forms a distance from tradtional “kuvarice” where everything was said directly, and everything was “in its place”. “A woman is always occupied with work, while a man is in a suit, so that you don’t know if he’s coming or going”, and this statement sounds very mild. Therefore, Brigita’s tool and weapon is humor. Time will tell whether these women are practical or impractical, and in what way. Their handiworks are already displayed at museums and private collections. The price itself indicates that artistic value is recognized, although money is not the point, nor the true measurement of quality. For these dedicated women, money stands for new opportunities to express themselves. And it transforms into canvases, threads and free time. There is no lack of ideas, wherever they turn. And finally, they can find them by looking inside their (beautiful) souls. 1 An idiom, a play on words in regard to an original idiom that warns women to restrain from talking, since there is food yet to be prepared. This could be translated to: „Talk more so you could be heard“. 2 German for “guest worker”; it refers to foreign or migrant workers, particularly those who had moved to West Germany mainly in the 1950s, 60s and 70s, seeking work as a part of formal guest worker programme (Gastarbeiterproramm). 3 Serbian traditional dessert, most often served on occasions such as birthday parties, New Years, Christmas and Slava (a Serbian Orthodox Christian tradition of the ritual glorification of one’s family’s patron saint). 4 A grilled dish made from minced meat, a type of skinless sausage, found traditionally in the countries of southeastern Europe (the Balkans).